Graphene has the potential to improve electronics, solar cells and other devices. 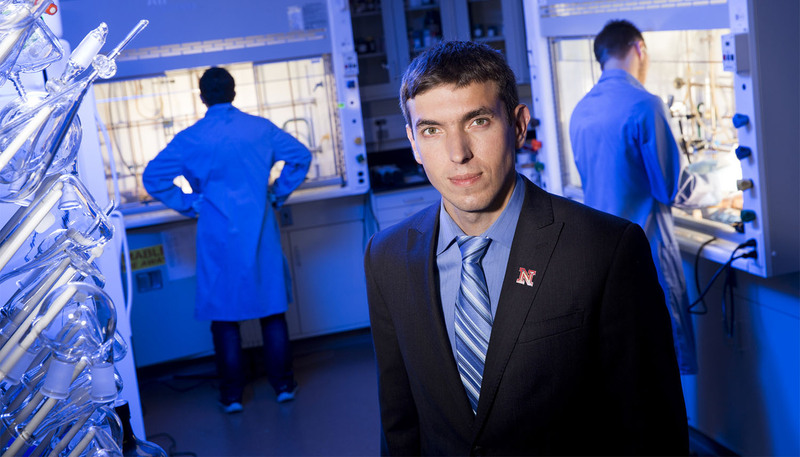 UNL chemist Alexander Sinitskii is testing this promising nanomaterial with a $538,500 National Science Foundation CAREER award. He’s capitalizing on a technique he developed to create atomically precise graphene nanoribbons, ultranarrow bands of one-atom thick sheets of carbon. The precision allows Sinitskii to create nanoribbons with different widths and edges. Now, he’s investigating how these differing characteristics influence the nanoribbons’ properties. Understanding changes in nanoribbon properties will help Sinitskii and others design materials that improve performance in diverse applications, such as semiconductors, solar cells and fuel cells. He plans to develop prototype devices incorporating graphene nanoribbons. Sinitskii is an affiliate of both UNL’s NSF-funded Materials Research Science and Engineering Center and the Nebraska Center for Materials and Nanoscience. 2006-2012: Christian Binek, physics and astronomy, $500,000 for education and research on nanoscale spintronic systems and heterostructures. Binek leads one of MRSEC’s research teams. 2008-2013: Axel Enders, physics and astronomy, $412,000 to study self-assembled magnetic nanostructures to improve data storage and other computing devices. Enders is MRSEC’s associate director. 2009-2014: Eva Franke-Schubert, electrical engineering, $400,000 for research on hybrid chiral nanostructures to enhance computing, electronics and solar cells or batteries. 2012-2017: Xia Hong, physics and astronomy, $600,000 for work on nanomaterials with both magnetic and ferroelectric properties, which may lead to novel materials and devices. 2013-2018: Jinsong Huang, mechanical and materials engineering, $400,000 to study methods for increasing solar cell efficiency using organic polymers as a semiconductive material.